Yvonne Jones recaptured what has traditionally been safe Liberal ground, rolling up a big victory over Conservative Peter Penashue in Labrador's federal byelection. Yvonne Jones recaptured what has traditionally been safe Liberal ground, rolling up a big victory over Conservative Peter Penashue in Labrador’s federal byelection. "When I was reflecting on this election win tonight, I was saying, ‘You know, I'm the first person in the country to beat the Harper government in a byelection,'" Jones told supporters at a victory party in Happy Valley-Goose Bay. "But that could never happen without all of you and many more across Labrador." Jones garnered 5,814 votes to Penashue’s 3,922. With all 91 polls reporting, the Liberal candidate’s share of the vote was 48 per cent, compared with 33 per cent for the Conservative candidate and 19 per cent for the NDP’s Harry Borlase. The CBC Decision Desk called the election for Jones just over an hour after the polls closed. Jones has been a fixture in Labrador politics since the 1990s. She represented the coastal Labrador district of Cartwright-L’Anse au Clair in the provincial legislature for 17 years before stepping down to run federally. She also served as provincial Liberal leader before a successful treatment for cancer. "Every movement starts at the bottom with the ground roots," Jones told supporters. "And the people of Labrador wanted change. Not necessarily a change in political party, but they wanted change in how Labrador is being dealt with. "They want representation that is going to put Labrador first, and I can guarantee you they got it tonight." She said Liberal Leader Justin Trudeau called to congratulate her, and the people of Labrador. Labrador has been a Liberal stronghold for decades. 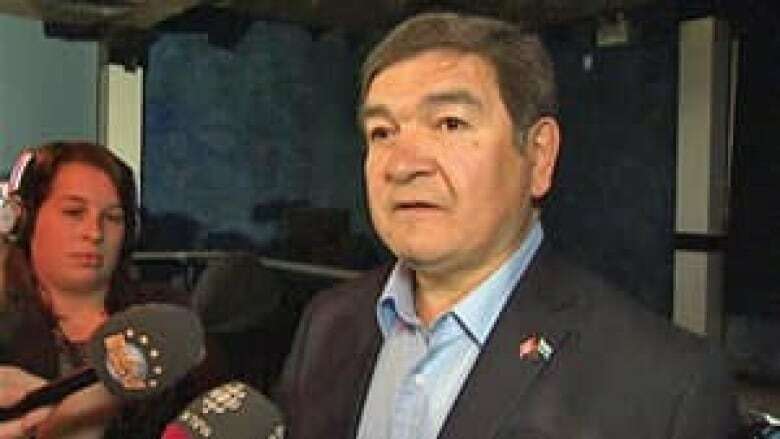 Penashue — a prominent Innu leader — wrested the riding away for the Conservatives in 2011, eking out a 79-vote win. He garnered less than 40 per cent of the ballots cast, and was helped by a stronger than expected NDP showing that siphoned off Liberal support. Up until that surprise victory two years ago, the region had only once gone Conservative blue since Newfoundland and Labrador joined Canada in 1949. Penashue quit as MP in March after repaying $30,000 in compensation for "ineligible contributions" he accepted during the 2011 election. He immediately announced he would run in the ensuing byelection. In an address to supporters Monday night, Penashue said it was an honour to sit in cabinet with Prime Minister Stephen Harper. "In a campaign like this, there has to be winners and there has to be losers, and this time around we’re the losers," he said. "But that’s the way it is. So we have to accept that and move on. And we have to respect and honour the people that made that decision." Penashue said he’s accomplished more in two-plus years than any other Labrador MP. He reminded supporters he's been running in elections since 1990. "Labrador lost, in my view," Penashue said. Penashue told reporters he doesn't know what comes next for him. "I've always landed on my feet," he said. The Labrador byelection has been widely viewed as a crucial first test for Trudeau as new Liberal leader. The Official Opposition New Democrats were also hoping for a strong showing. And the stakes were high for the governing party. Since taking power in 2006, the ruling Conservatives had never lost a byelection in a seat they held prior to the vote. As Jones referenced in her victory speech, that changed Monday night. Newfoundland and Labrador has not been fertile territory for the federal Conservatives in recent years. Penashue was the sole Conservative MP elected in the province in 2011. In 2008, the Conservatives were shut out, delivered the "goose egg" threatened by then premier Danny Williams over a conflict with the prime minister. After Penashue resigned in March, Harper called him "the best member of Parliament Labrador has ever had." When Monday's results came in, Conservative spokesman Fred DeLorey issued an emailed statement commenting on the "collapse" of Liberal support compared to earlier polls — something he attributed to Trudeau. "As we know, majority governments do not usually win by-elections," DeLorey said. "In fact, Liberals have won the riding of Labrador in every election in history except for two, so we are not surprised with these results." Elections Canada reported lineups at some polling stations when they opened at 8 a.m. Monday, and turnout was steady throughout the day in Happy Valley-Goose Bay. The byelection was complicated by a spring snowstorm that hit the north coast near Natuashish. Elections Canada permitted the use of transfer certificates, allowing voters stranded by weather to cast their ballots at other polling stations. Voter turnout in the riding was nearly 60 per cent, six points higher than in the 2011 general election.